A list of staff within a company or organization can be created in many different ways. Maybe you have an Excel list like the one below where all details about each staff member is filled out? It contains a lot of information but looks rather boring. For the team site you would want something nicer, and all information is not needed there. 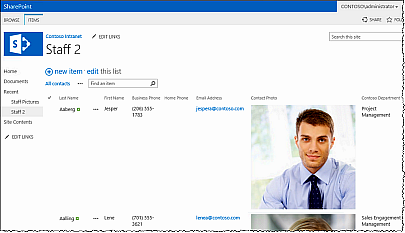 A photo of each staff member is a good addition, though, and it can be handled much better in SharePoint than in Excel. I show how to do it in the demo below. Two different methods can be used to import an Excel list into SharePoint. Both starts from an Excel table, so you must first format the Excel list as a table. Then you can either export this table to a SharePoint list or use an Access query to get the Excel list into a SharePoint list. The first method, to export an Excel table to a SharePoint list, is the easy one. It gives you a new SharePoint list that will be useful after some modification. This modification is done in SharePoint only, so if you are used to working with SharePoint lists it should be quick. The Access method is more complicated, but it gives the best result. In the kalmstrom.com Tips section we have an article on how to import an Excel table to a SharePoint list. It gives you not only the demo but also a step by step description of this second method. The result will be a pleasant list with photos of all staff. A click on the name opens a new window with more information about that person. In my demo I have used rather big photos, which looks good but entails a lot of scrolling. I would actually recommend you to use smaller pictures if you want to try something similar. Access, Excel and SharePoint are potent platforms that work well together. We should make use of that, and in the kalmstrom.com Tips section you can find more tutorials about these three platforms and how to combine them. You are welcome to have a look! Thanks for this tuto but I have questions. I create contacts list in sharepoint, I upload picture but with attachment file. What is great is that you have a windows to upload pictures to sharepoint, what is not nice is that you cannot see the picture in the list !? is it possible to add button to open windows to upload pictures directly to my Pictures Gallery. Second problem is that I connect my Contact list to outlook, when I put pictures in attachment, I see pictures in outlook, when I put in a picture gallery, I don't see them. Excuse my bad english, I hope that you understand. Hello Julien. I have no problems understanding what you mean :-). For the first problem you mention I have a solution, because there is actually a button - the Open in Windows Explorer on the Library tab. The second issue is worse. I noticed that too, and regretfully neither I nor Microsoft have a simple solution for this (yet). Please inform me if you find a solution!